View More In Inflatable Bouncers. Material:Use 840D and 420D polyester coated PVC, Comply with ASTM and EN71 toy safety standards, environmental-friendly and safety for kids, high quality and rarer material in market. Sewing: Double-stitched reinforced seams and jump surface commercial grade sewing style. Inflate and deflate: Easy to set up and take down within 2-3minutes. Netting and mesh: High quality netting or mesh with small holes for safety. Blower: Powerful blower with CE&UL certificate and correct plug. Opening: Velcro opening for safe and easy to go or out. Air tube: Long fill tube for placing blower away from the bouncer. Anchor or D-ring: Anchor or D-rings to keep stability and safety. Recommended for children aged 3 - 8 years (100 lbs with max height 5 ft). Do not stop blower during use. Ages 3 - 8 years and is not intended for children under 3 years. Adult supervision during set-up and take down required. Do not leave children unattended due to their inability to use safely. Not suitable for hiring or commercial use. Airflow through seams is normal, do not try to seal or repair seams. Some pinholes are location of sewing, not the fault of quality. Color vary or fading for long time. 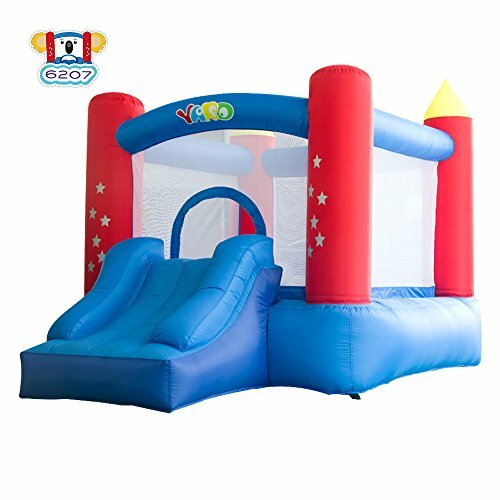 YARD Bounce House with Slide Size: 9.5'x 6.5'x 6.5', suitable for outside and inside, ideal for almost anywhere in or around house, in backyard or living room, children could play in a rainy day. Kids can sliding and bouncing, play area (6.5' x 6.5') which is large enough for 3 kids to jumping on the inflatable bouncer at once. Your children will have hours of fun jumping in YARD Bouncy Castle. Designed with safety features and comply with manufacturing laws. Stakes anchor the bouncer firmly in ground. Mesh net protect children, your kids will bounce freely while you take comfort knowing they're well protected by safety netting. Easy installation and quick setup with blower. Easy deflation by air tube. Maximum portability with storage carry bag included. If you have any questions about this product by YARD, contact us by completing and submitting the form below. If you are looking for a specif part number, please include it with your message.